Abbreviated Title: J. Entomol. Zool. Stud. 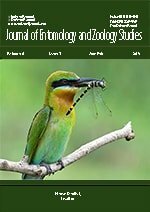 The journal publishes articles in all fields of zoology which includes: Apology, Arachnology, Arthropodology, Cetology, Conchology, Entomology, Helminthology, Herpetology, Ichthyology, Malacology, Myrmecology, Nematology, Neuroethology, Ornithology, Paleozoology, Planktology, Primatology, Zooarchaeology, Zoosemiotics, Vector Molecular Biology, Molecular Endocrinology, Pharmacology, Veterinary Sciences, Parasitology and Immunobiology. This Journal is an ideal platform for anyone working in Zoology. Publications are welcome from students and professionals alike and will solely be judged on their content and scientific merit. Its publication frequency is Bimonthly. On the behalf of the Journal of Entomology and Zoology Studies, I would like to extend my regard to all fellow researchers and scholars and wish prosperity in their field.